The Rail Interiors Conference was held in Berlin in the Scandic Hotel on the 13th and 14th of December. The programme included presentations from Alstom, Siemens and Austrian Rail as well as from Martin Darbyshire of tangerine and Paul Priestman of Priestman Goode. The speakers are listed here. What is clear is that the rail sector is fighting hard to become more customer focused and to be a viable alternative to air travel. Somewhat ironically, it is therefore trying to see how lessons on customer experience may be transferred from aircraft cabins to railway carriages. Some examples are beginning to emerge. Austria's operator OeBB has introduced the Railjet service with three passenger classes (Economy, Business and Premium) to choose from and particular attention paid to passenger flow and airline-style 'comfort seating'. Alstom Transport is building a stronger design focus in its innovation strategy to create compelling passenger experiences and trains that can lead the sector. For Alstom, the key interior design issues were presented as Access and fluidity; Brightness and lighting; Modularity and Perceived quality. When creating the AGV the concept was of 'a tube to design' with a focus on the passenger experience as 'connected, easy and exclusive'. Giving the second keynote of the two days Martin Darbyshire spoke about tangerine's distinctive innovation process and how processes and similarities within the airline sector could offer value and insight for train operators and manufacturers alike. The rail sector is beginning to discover and utilise in new ways the power of design to drive user-centred, non-technological innovation. The urgent need is to raise quality overall to a new level; to drive in creativity to meet future passenger and operator needs and to increase passengers' perception of quality. Only by doing this, can the rail sector hope to attract an increasingly demanding and sophisticated travelling public away from other modes of travel. Well. It's been quite a while since I have had the chance to write here. Life has been busy. I completed the development and facilitation of the DBA's new Executive Leadership Programme, 'Re-imagining Leadership' held over two days in York with 26 very senior participants at the beginning of November. It has been recognised in participants' evaluations as an overwhelming success which is a powerful testimony to the contributors, Jon Teckman, Toby Scott and David Lomas of the Penticle Business School, Emma Collins, Sarah Benton, David Baker and Marco Steinberg. Great work everyone. Well done DBA. Thank you participants for making it such a success. Since then I have been in Geneva and Lyon although a spot of the flu prevented me from both attending a cities conference in Cite du design in St Etienne and subsequently chairing the education session at the Design & Learning conference held in Brussels and organised by the EU Commission on 25th and 26th November. Last week I hooked up with Matt Rudd of Rudd Studio. Beautiful work. And last night was a chinese meal in Soho with Massimo Pitis of Pitis in Milan. A week of graphic design and visual communications. Tomorrow I head off to Berlin to meet with Embassy Experts and then catch up with Erik Spiekermann at Edenspiekermann on Friday. (I used to work as a business development consultant for MetaDesign in London). Next Monday and Tuesday sees the Rail Interiors conference also in Berlin with Martin Darbyshire of tangerine giving a keynote. He will be speaking about tangerine's experience in the airline sector and spotting points of relevance in innovation behaviour that might be of value to the train sector. Should be interesting. The following week sees me back in la bella Italia, firstly with the wonderful Massimo Iosa Ghini in Bologna and then back to language school - this time in Arezzo in Toscana. And then it will be Christmas. I went to a Halloween fancy dress last week togged up as the Duke of Wellington, (the theme was 'dead famous'), and this week I find myself thinking of the Grand old Duke of York. I am at the wonderful Cedar Grand Hotel in York, about to lead a two-day Executive Programme on leadership for director-level personnel in design companies that I have had the opportunity to put together for the Design Business Association, (DBA). The DBA's goal is, 'to accelerate the growth and increase the sophistication of design businesses through improved leadership practice'. This is to help them further strengthen their capability and capacity to compete more effectively in a globalising world. For the 26 participants, the two-days is intended to, 'elevate and enhance their view and understanding of leadership and provide ideas, insight and tools to take back to their businesses to create greater impact through improved leadership practice'. We have pulled together a great team of UK and international contributors. When this is combined with the experience and knowledge of the particpants who have come to York tonight from all over the country, (and with attendance from Scandanavia as well), I know that we are in for an exciting, insightful and transformative two days. Well done DBA. More anon. I visited the V&A last weekend and went to see the new ceramics gallery. I did this as I wanted to see the graphics created by Cartlidge Levene and I was not disappointed. The work is very clean, very understated and very integrated across the galleries. In one of the showcases I was amazed to see this 1970's ceramic tea service. It was introduced to the market when I was still at College. I had not seen it for many, many years and when I saw it, it was like meeting an old friend. It might be hard to believe now, but way back then as a young student, it's lines inspired me to design and make a sterling silver tea service - a tea pot, sugar bowl and milk jug. I will try to find a photograph of it. Thanks now to Martin Hunt of Queensbury Hunt for inspiration then. 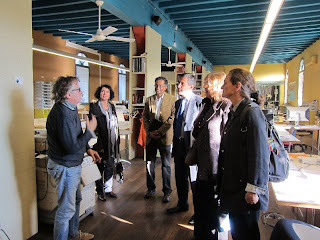 Tuesday 21st October saw the start of the Barcelona Design Week. I was the last speaker of the first session following on from great presentations from Paul Jeremaes Director of HP Innovation Centres , (on the business of innovation); Liz Sanders from Make Tools in Ohio, (on design driven co-creation) and Steve Rogers UX Director for Google EMEA, (on the relationship between creativity and data). Paul spoke about the system that HP have put in place across eight centres to help their top 2000 clients engage with innovative thinking and processes supported by HP. All CEO’s believe in innovation and that it has strategic importance. But it is still difficult to do. Especially as the lifecycle of innovations is getting shorter. (HP generates 6-700 product or services a year with most revenue generated from those delivered in the last two years). The innovation activity in HP is categorised in four containers: for HP (internal); for customers, with customers and enabling customers. Paul’s focus was on innovation with customers. The HP Innovation Centres form a platform for HP Execs to help them be creative, focusing on business breakthrough to expand their visions and pull through to business results. And it is is 'killer innovations’ , (a significant and highly profitable departure from current offerings or practices that is difficult to imitate), that are being sought. The Innovation Centres provide personalised, immersive environments and tools such as graphical facilitation and rapid concept prototypes. In meeting the innovation imperative, HP works with their clients to design innovation experiences in an immersive environment. Liz Sanders spoke to us about her work in the field of co-creation, starting with a history of the language we have been using for people in the field. This started with customer, consumer, (1980’s); user adapter, participant, (1990’s) and co-creators (2000’s). In other words it has moved from expert driven through user-centred to co-creation. Make Tools works with people to help them enact and act out in the generative, ‘intentional design space’ to solve wicked problems, inviting co-creativity. On whether or not designers should 'lead innovation', she prefers to think of design as 'seeding innovation'. Designers provide the fertile ground to enable others to be part of the creative process. Steve Rogers told us that Google’s top principle for creation is, ‘focus on the user and all else will follow’. Steve then talked us through the role of data at Google asking the question, ‘should creativity be reduced to data?’. Referencing the recent discussions on whether or not it is 'possible judge a shade of blue with data', Steve’s view on data to support creativity was “Why not?...". If data can help support creativity and better design, then it should be embraced. And of course, one of Google's key assets is its ability to scale because of the magnitude of its data collection and analysis. The role of data was then described in Google’s process to develop one of their latest innovations for Google Mail, the Priority Inbox. This related to maximising the benefits available through usage data and with customer insight, to create and rapidly test (globally) the an automated filtering system for emails. The filtering process identifies and separates ‘important’ emails and ‘all the others’. And key to that process was the definition of being able to connect ‘relevance plus recency’. Steve closed with an animation of new ways of visualising data showing a very elegant 'living' plant form on the screen in visualising the battery state of a mobile handset when charging (and not a simple little battery icon with bars). 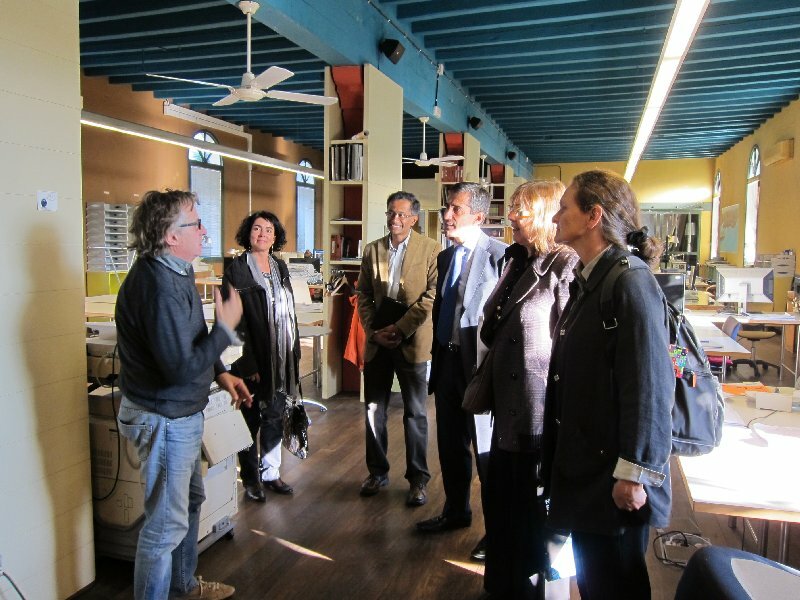 On Tuesday afternoon Isabel Roig of Barcelona Design Centre brought the four speakers from Day 1 of Barcelona Design Week on a design tour to the creative enclave located in the beautiful area of Palo Alto in @22 to the East of the city. Palo Alto means tall stick and the creative area is in an old factory complex with three tall chimmneys - hence Palo Alto. We had the chance to visit three amazing design companies. It was really great to meet Javier Marsical at his studio and to speak with him and Tono Errando (co-director and younger brother) about his new animated movie 'Chico & Rita' (to be released in London on 19th November). Directed by Javier and Fernando Trueba, Javier told us it is a love story set in Cuba in 1948 between a woman from New York and a man from Havannah. But it is also a love story about the two cities and with the evolution of jazz. It took three years to write the narrative and scripts and three years more to animate the story. Animating with thick lines is very challenging and in addition to this, over the three years, the technology available to animators keeps changing. The movie has been very well received in Cannes and Javier told us that it is 'a very moving story of the heart' and promised us that we will cry when we see it. Following this wonderful half hour, we then met with the guys at Equip a multidisciplinary architectural practice founded in 1990. They have three key premises in their philosophy: permanent reinvention in our approach to understanding; being closer to people and redefining approaches to respond to situations as they arise. The practice is particularly multi-disciplinary as they are working on hugely diverse projects including high rise buildings; cutlery, jewellery, bathroom taps and, through a subsidiary company, on the design of the Galactic Suite Space Resort. Marc Zaballa Camprubi of Galactic Suite Design talked us through the development of the project. It was interesting to hear this in the light of Richard Seymour's presentation on Virgin Galactic in Belfast earlier this month. (See my Blog for October 14th). Space tourism is a reality. Finally, we went to visit Josep Morera CEO and Creative Director of Morera Design, one of Spain's leading packaging & branding consultancies that specialises in the premium & luxury segment covering fragrance & cosmetics, luxury waters & beverages and wine & spirits. Also based in a beautiful building in the Palo Alto complex, Josep graciously gave time to speak with us even though he happened to be particularly busy at that moment in time (we arrived a little late) and definitely not helped by the fact there had been a power cut earlier in the day. Thanks Josep for so graciously taking time with us to tell us your great story. Barcelona Design Week has been inpsiring and it's not over yet. Mike Rawlinson Director of City ID and I are attending this morning's mobile design conference 'Designing for the Networked City' with presentations from Kevin Slavin (Starling, New York), Matt Jones (Berg, London), Usman Haque, (Design + Research, London), Fabien Girardin, (Lift Lab, Barcelona). 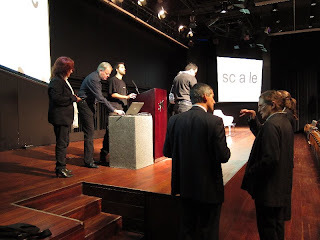 This to be followed by a workshop on co-creation for the networked city led by Liz Sanders (Make Tools, Ohio). I am giving a keynote on design strategy at next week's Barcelona Design Week. As for previous years it is going to be an excellent mix of events with great speakers and participants alike. The overall theme is 'Facing New Challenges Through Design' and it all kicks off on Monday 18th with a Round Table and Award Ceremony for Design Management. The website for Barcelona Design Week 2009 is also still live. On Thursday 14th October the report of the Design Council Review in the UK was made public. This is the first review since 1994. The Design Council is a non-departmental public body (NDPB) funded by the Department for Business, Innovation and Skills, with co-sponsorship from the Department for Culture, Media and Sport. It is worth noting that this review (launched last July) sits within a much larger overall review of such bodies in the UK public sector landscape. The press this week have been referring to the bonfire of quangoes, (quasi-autonomous non-governmental organisations), with 192 organisations losing NDPB status and 118 organisations being merged into 57. A further 171 are being retained but substantially reformed and 40 are still under review. The full list is at the Cabinet Office's Public Bodies Reform listing. Thankfully, the main conclusion of the review is that there is, "a compelling case for the Design Council to continue", and for it to, "champion design at the heart of national priorities". However, not in its current form. The Report authored by Martin Temple and the Review Team contains a set of recommendations to Ministers to change the Design Council from its current status as a Non Governmental Departmental Body to a charity independent of government, whilst at the same time maintaining its Royal Charter, and with reduced funding from government (to be reduced from £5.4m to £4m). It is anticipated that the Design Council will move out of its current premises to a shared space with NESTA where economies of scale on back office functions etc can be achieved. Other partners are the Design Museum (with a move to its new space indicated by 2014) and the Technology Strategy Board. On first read, the most significant departure seems to me to be that the Design Council will set up a commercial arm, (a 'trading subsidiary'), through which to provide a 'defined range of intermediary services to industry, the public sector and to governments' - note the plural on governments. The services provided will include coaching top teams, public commissioning and open innovation projects (eg in healthcare and crime prevention). This will build upon its existing roster of Design Associates (working with companies on design projects and design management) and specialist project managers. The report (Appendix F) in its operational plan specifically states that any profits will be covenanted back to the charity to support charitable aims and that explicit terms of reference will be created with the design industry and design organisations to avoid any potential or perceived conflict of interest. The Design Council's future roles are indicated as four pillars under a new model of activity. These are listed as: Government Advisor (policy development), Demonstration (market making), Knowledge Networks (capacity building) and Broker(connections to design). When Commission Vice President Tajani launched the Innovation Union on 6th October 2010, it was almost exactly three years to the day since I had led the BEDA delegation comprising Severin Filek, Design Austria, (BEDA Past President); Isabel Roig, Director Barcelona Design Centre,(BEDA Board Member), and Henrique Cayatte, (centre in photograph), Director, Portuguese Design Centre (BEDA Board Member), to meet EU Commission President José Manuel Barroso in Lisbon on Monday 08 October 2008. I should point out that this meeting was the culmination of some ten years of lobbying by BEDA for design at the European Level. On that morning during an hour-long meeting at his personal office in Lisbon, BEDA presented President Barroso with the need for the Commission to act coherently at the European level to maintain, develop and increase Europe’s unique design power. We asked for his personal support, "in the creation of a strong European mechanism in order to build Europe’s design competence for the 21st century as a complementary strategy for Europe’s innovation performance." 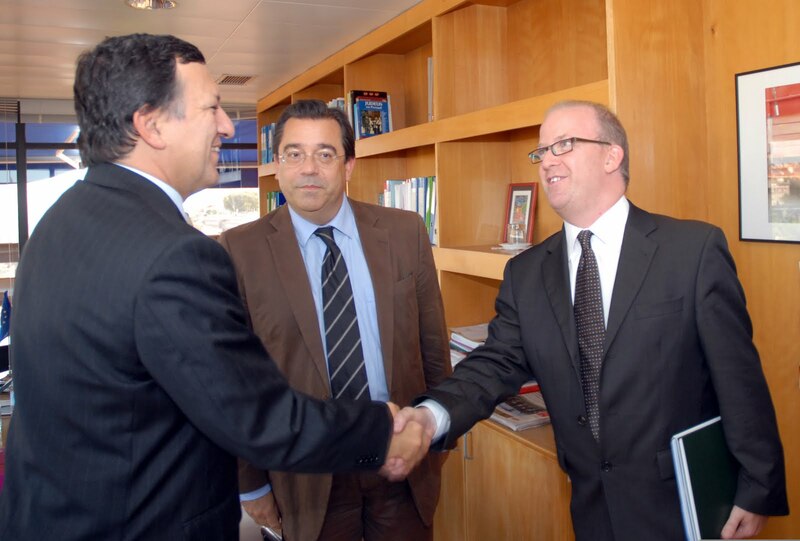 At the close of the Meeting President Barroso asked us to meet with his then Commission Vice President Gunter Verheugen, a meeting which took place in January 2008 with myself and then BEDA Vice President Jan Stavik attending. These two, seminal meetings, I believe, triggered and led to the current developments for design at the European level with the publication in April 2009 of the Commission Staff Working Document, 'Design as a driver of user-centred innovation' the incorporation of design in the Conclusions of the Council of Ministers, the introduction in 2010 of design into the EU Innovation Union and in 2011 the establishment of a European Leadership Board for Design. 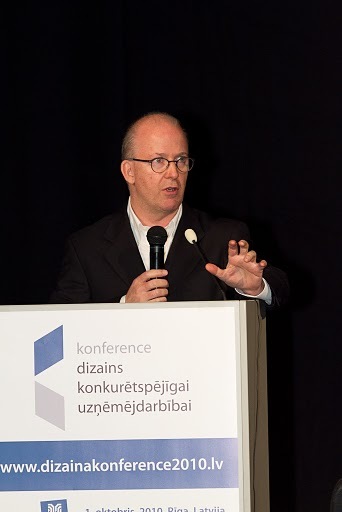 There is much that remains to be done in order to ensure that design as an activity and strategic tool remains core to entrepreneurship and industry across Europe, (firmly placed within the innovation agenda), whilst also contributing as a key player within the wider framework of the creative industries. Congratulations to all of the many, many people inside and outside the Commission who have played a part in making this dream a reality and in particular to the past and present Boards of BEDA with whom it has been a pleasure and a joy to work with. On 6th October, Commission Vice President Antonio Tajani and Commissioner for Research, Innovation and Science Máire Geoghegan-Quinn launched the European Commission's new strategy for innovation. Called, 'Innovation Union', the strategy will sit as a 'flagship' within 'Europe 2020', the Commission's replacement for the Lisbon Agenda. The launch is very gratifying as the strategy for the first time has design included as an important ingredient at the European level. 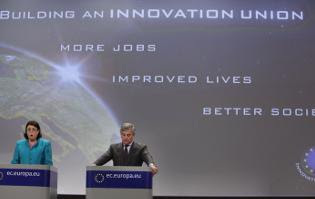 When presenting the Innovation Union to the press, Tajani emphasised design as a European strength and important driver of innovation. The Innovation Union recognises design as a key innovation discipline and activity to bring ideas to the market, and announces the launching of a European Design Leadership Board in 2011 that will be invited to make proposals within a year to enhance the role of design in innovation policy. Information on the strategy is at the website and the press release and text give further details. A good event on Tuesday 12 October in Invest Northern Ireland’s ongoing, ‘Design in Business’ Series. Tim Brundle, Director of Innovation at the University for Ulster, welcomed over 200 delegates to the Stormont House Hotel. Speaking about design and Apple and the power of competitors to sweep rivals away with disruptive innovation, (who owns a British made TV? ), Tim welcomed delegates on behalf of Invest Northern Ireland, (of which he is a Board Member). Richard Seymour then presented a 50 minute keynote on the importance of emergent behaviour, planning for discontinuity and the parable of the lasagne bolstered with shots of Richard Branson’s Virgin Galactic test which Seymourpowell have worked on extensively. 42 people, 146 million $ and 100% belief. As for the parable of the lasagne, it is better for you to hear Richard telling the story sometime somewhere. It's good. The seminar concluded with the four design workshops – brand, product design, digital design and design strategy. A very successful event all round. And it was great to be home in Northern Ireland just as the trees are turning to Autumn. Here I am sitting at my desk at a great hotel in Avila, Spain about an hour and a half from Barajas Airport where I will catch a 09:55 flight tomorrow morning to Belfast connecting through London. Invest Northern Ireland is the economic development agency tasked with helping Northern Ireland businesses to grow and expand into new markets. InvestNI has invited me to MC a seminar, 'Harnessing the power of design', one of a number of events in their 'Design for Business' series. Attendees will comprise Invest NI Companies, locally-based SMEs and key stakeholders from the economic arena. About 150 delegates are expected. Richard Seymour of seymourpowell is the guest speaker. I have also been invited to run one of four workshops for delegates that follow on from Richard's presentation. These cover brand, digital design, product design and design strategy, (which is the one that I am presenting). And what can design strategy mean for companies that are small and medium-sized, operating in a recessionary environment and located in a relatively small population mass of 1.5m people? Well of course, I believe that design strategy is particularly important in such a context. Gaining differentiation and mindshare with your end consumers / customers is critical and so therefore is the development of strategic, user-centred foresight and story-telling skills in support of the ability to sell within and beyond your existing markets. Creating differentiation (and even new markets) through all the routes available to a company - from identity to brand and packaging to product / service (at the right price-points) - is key and requires strategic design thinking and process. And for SMEs in particular, pragmatism is vital, especially where the business strategy might actually be, 'stay alive'. Design strategy must work and be effective in creating the right journey to travel on. I have been invited by the Minister of Science and Technology in Spain to sit as a juror on the Premios Nacionales de Diseño - Spain's National Design Awards tomorrow, Monday 4th October. 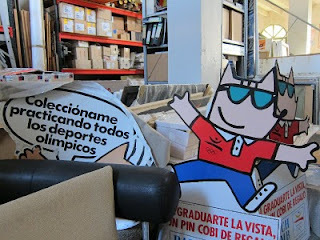 The award is run by the DDI in Madrid. 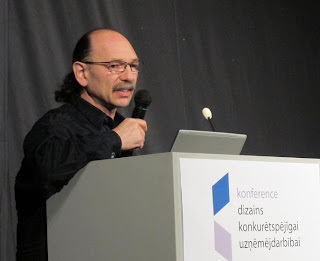 Here is Boris Berlin of Komplot in Denmark, (not the Berlin-born singer-songwriter-producer based in NYC), speaking at the conference in Latvia. Quiety spoken and inspiring, his work with his creative partner Poul Christiansen has produced iconic pieces of furniture - some of which are in Moma. The world is changing dramatically. We already face huge-scale, complex challenges in our communities and societies. We have a turbulent and often destructive relationship with our environment and planet. We see complex, systemic challenges ahead of us that defy logic and traditional methods of problem solving. We are entering situations that demand ‘new ways of working’ and new combinations of skills. With this in mind, I took the opportunity to outline some of the attributes, skills, characteristic behaviours and methods that design learning for all would encourage and develop in all our young people. Equivalent levels of fluency in visual language as in word and number; visualising thinking and ideas; creating new concepts in response to complex challenges in multi-learning-style teams; configuring ideas; working horizontally across disciplines and content boundaries; being user-centred in the ‘problem definition’, ‘re-definition’ and ‘resolution’ process; thinking ‘strategically creatively’ (as opposed to artistically); switching seamlessly between expansive, big-picture-thinking at the level of possibilities and concepts and the micro-level of detail and implementation. Empathy for others; facilitation skills; interpersonal skills; confidence; handling doubt and uncertainty; managing and taking risks; courage; belief in ideas; mapping; empowerment of others; leading by facilitating and influencing; being open to changing course as necessary and being open to surprise and unanticipated results; non-linear non-sequential thinking; team working; insight into personal learning styles of others and behavioural trends. All of this to be underpinned by a number of core values including sustainability, design for good, empathy for users and the concept of beauty. (Not a word we hear very often nowadays). And all of this, feeds off the deep well-spring of an innate human attribute common to us all – creativity. Perhaps the design imperative may not only be about supporting better innovation and increasing wealth creation at the level of the economy, but also, crucially, about a development in our understanding of learning. Of course, design is not the answer to everything. It is not the panacea for all our ills, but I believe the bigger and broader idea of design is still a rather narrowly-defined concept in our societies. There is still more to reveal and discover. There is potential in extending it far beyond the domain of professional practice and specialist education. As I concluded at the conference, the concept of a storm has within it the knowledge that the storm will pass - it will be over - hopefully sometime soon. But in the new world, perhaps the storm is here to stay. The storm is the weather now. Through the auspices of the British Council I was invited to lunch with the British Ambassador to Latvia, HMA Andrew Soper at the British Embassy on Wednesday of last week. Other guests included Dace Melbārde, Country Manager of British Council Latvia, Dr. Diana Pauna, Pro-Rector of Stockholm School of Economics, Maija Ūdre, British Council Latvia Marketing and Communications Manager, Gatis Mūrnieks, winner of the British Council International Young Creative Communication Enterpreneur Award, Santa Plivča, of the UKTI in Latvia, Gunta Sloga, Director of the Media Programme of the Soros Foundation-Latvia, Miks Petersons, designer, organiser of the annual design conference in Latvia and project manager of the Latvian Designers Association and Marta Jaksona, Communications Manager/Political Officer of the British Embassy in Riga. Over a three-course lunch we discussed the needs of creative companies with a focus on design, particularly small companies. The needs of Latvian companies were also raised and we explored opportunities that could exist in Latvia for British design companies. Latvia, as a part of the Baltics, could be a gateway to business not only in the Baltics, but also further afield into Eastern Europe. Lunch was concluded with a handshake with the Ambassador. I had the chance last week to travel to Riga in Latvia as a guest of the British Council. On Thursday evening I ran a two-hour workshop with local entrepreneurs, creative companies, designers and arts managers. The workshop was the second meeting of the British Council’s Young Entrepreneurs Club in Latvia and the theme was ‘expanding the scope of design’ as the creative industries in Latvia need to look beyond the borders of their country to find new markets for their services and products. We had a skype conference (analogue transmission) from the amazingly flexible Dan Ziglam at DeadGood live from his London office (they are HQed in Newcastle). Dan is a former British Council Young Entrepreneur and he spoke about the journey that he and his partner Elliot Brook had travelled to get to where they are today. This was a very open and really helpful dialogue for the workshop participants. Then we had a live, in-the-room, face-to-face, physical presentation (terrestrial transmission) from Artis Nimanis the young director behind An&Angel, a local company designing and producing creative crystal and glassware. They have developed some very sophisticated ways of creating layers of colour in glass and have just returned from exhibiting at this year’s Maison&Objet in Paris earlier in September. 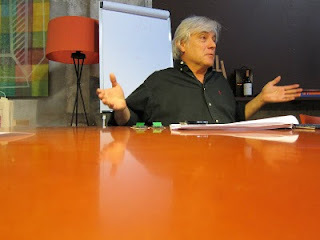 He too gave a very frank description of the challenges and opportunities that young creative companies face. 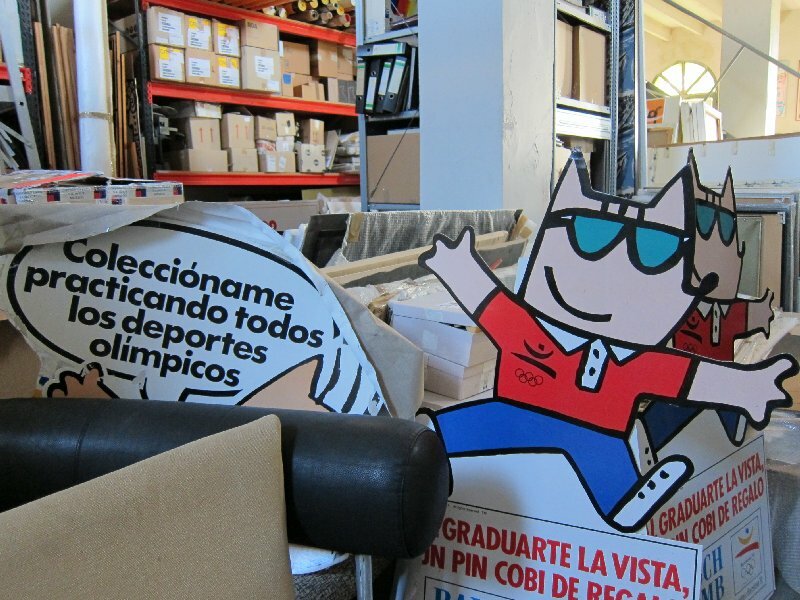 The company is currently working to export his products to Tokyo, Germany and France. A repeating theme was the need for Latvian companies to develop better marketing abilities and to grow their competence and confidence to look to markets outside Latvia. * Access to finance. Currently, young entrepreneurs in Latvia can get access to some finance, but they need to pay all the costs up front. Only if the grant awarding authority deems the project to have been a success will the company receive funding. * An active design policy from the government that promotes Latvian design and the role of design into Latvian companies. This would build upon the work being done by the Latvian Design Information Centre and would also build on design policy work completed previously - around 2004-2006 - that currently sems to have stalled under recessionary pressures ( I was told). There is also work that has been completed with regard to the Creative Industries with the definition of the creative industries of Latvia having been entered for the first time into the Guidelines for the State Cultural Policy of Latvia for 2006 – 2015. The British Council was involved in the document, 'Creative Industries in Estonia, Latvia and Lithuania', published in 2010. Thanks to Dace Melbarde and the team at the British Council for involving me in this second event of the British Council's Young Creative Enterpreneurs' Club. The DMI conference, 'Transforming Design' held in London on the 7th and 8th of September brought a number of very insightful presentations to a large audience of over 200 in central London. Here are a few comments and observations. More later. Geoff Mulgan from The Young Foundation spoke of the need for design to recognise, in moving into design for social needs (social innovation), that there are already a number of powerful players operating in that space. These include user groups, NGOs, politicians, policy makers, social entrepreneurs and public sector managers to name but a few. In this space, design value in use is more meaningful for users than monetary value and outcomes should bve designed to create important new relationships. Geoff spoke eloquently on the need to master the 5-step process for systemic change that they have developed. Starting with 'prompts' and moving through 'proposals', 'prototypes', 'sustaining' to 'scaling'. The Young Foundation's empiric experience has also enabled them to arrive at 8 creative social design tools for partners and collaborators. These are inversion, addition, integration, subtraction, extension, translation, differentiation and grafting. What design has does not exist in hospitals and government. It is very valuable, though Geoff was careful to advise designers to 'discomfort yourselves and be humble to what you can learn from them [the players already in the field]'. The design directors of both LEGO and GE Healthcare gave insightful presentations from two very different contexts. Mike Ganderton, Creative Senior Director, LEGO Group told us that LEGO was only a few years ago, a company that was in a rapid downward spiral. It needed to urgently and dramatically reorganise itself in order to get back to the fundamental and core values of what LEGO stands for in the mind of the consumer. They had to make LEGO that consumers wanted, not LEGO that the design department thought consumers should have. Business leaders were assigned to head up design and design management consultants PARK were brought in. They set up the Design for Business (DforB) programme. The learnings in failures have led them to distribute design in equal status with marketing, production and sales in project teams. This came with the painful recognition that incremental innovation was the key to survival and growth, and not radical innovation. Further down the line, a defining moment came when the Design for Business programme was embraced by other parts of the business. Design managers now based decisions on fact and insight and not emotion. Design directors have equal impact on the business to marketing directors. In effect, Lego designed what it meant by innovation within the company -'a one innovation language'. The designers became grounded in the business answerable to business KPIs. Design is now integrated within and closely linked to projects in a high speed business with multiple stakeholders. François Lenfant, Manager, Global Product Design, Developed Markets, GE Healthcare told a different story of GE Healthcare ($157bn with 304,000 people in 160 countries and a $5.2Bn spend on R&D). The company is asking itself how it might create global platforms and yet at the same time create personalised healthcare. It is moving from management of disease to management of health. With a design team of 37 operating on a huge global portfolio of products, (which are low in volume and high in embedded technology), François spoke tellingly of design's need to be humble. 'It is not design alone, but it is also design'. Design is needed to interpret the hidden expectations of customers as, based on the voice of the customer, GE Healthcare knows well what customers want now, but they do not know what they want tomorrow. François is growing the design capacity and has moved the design team to a new 'destination' for design within the corporate culture. He is centralising the function and building its influence. Driven by the proposition to 'express the magic of science and empathy', design is transforming how GE develops healthcare and design is transforming the business. Lego disperses its design function across projects; connects it to business goals and metrics and integrates it on an equal footing with other functions of the business in order to be closer to corporate strategy. GE Healthcare is building a centralised design function in a new space as a separate 'destination' in order to maintain and grow design's influence to transform the business. Two different contexts with two very different approaches emerging out of those realities. The Young Foundation designs social innovations in a collaborative and user-centred approach that integrates a diverse population of stakeholders in projects that must be designed from the outset to move from seed to scaled success. At the opening of his presentation, Mike Ganderton asked the question, 'Is there anyone in the audience who was NOT a child once?' Each presenter, in their own way, expressed the need for design to be a humble participant open to learning from others in the cycle of creation. How can we, the insanely successful, truly find ways to develop new constructs of meaning, purpose and action through strategic design to build prosperity of mind and behaviour that could unlock transformation for the millions of individuals in our societies across the globe that we currently fail? A well facilitated conversation with a wide range of participants from around the world, sitting in a double-ringed circle the size of a mini ballroom, can create a crucible within which some serious thinking can take place. The third and final day of Marco Steinberg’s inspired and inspiring Helsinki Design Lab on Friday 3rd September 2010 was just that. In ‘A Changing World’, the first of two facilitated sessions, Alan Webber, (editor, reporter, speaker, writer and co-founder of Fast Company magazine), asked the panel comprising Mikael Jungner (General Secretary of the Finnish Social Democratic party), John Kornbum (distinguished American Diplomat and former US Ambassador to Germany), Ramchandra Kulkami (CEO of Cybernetic Research Labs, India) and Tuomas Toivonen (an independent architect, musician and thinker), ‘Where do you look to see the future?’. In listening to the panel’s responses and the conversation that these triggered, three thoughts came together in my mind, each of from different times in my life. Firstly, from five years hard yet deeply rewarding experience back in the Eighties teaching in a tough, local secondary school. Secondly, jumping forward nearly twenty years, being engaged in a national design strategy project for Her Highness Sheikha Mozah Bint-Nasser al Misned in Doha in 2007/8 and finally, rather bizarrely, on something glaringly obvious – but only once it is noticed – from that science fiction television series of the future – Star Trek. In October 2007, Her Highness Sheikha Mozah was awarded the Chatham House Prize in London. At the award ceremony she gave a defining speech which included her vision for design. Sixty years ago, the people of Qatar were largely dependent on pearl fishing - a poor society with no role on the global stage. Today, thanks to the discovery of high grade petroleum in two fields off the coast the Qatari nation is now extremely rich. If I remember the numbers correctly, there are only 171,000 indigenous Qataris in a population of 800,000 that is projected to grow to some 1.2 million by 2015. The Chatham House speech was a powerful stimulus and guide to myself and John Geldart, then Director of VCUQ's* Design Research Lab in Education City, on our work for Her Highness in designing an International Design Zone for Qatar. Her Highness’s vision was that design thinking, as separate to the faculty of critical thought, could help to bring about “prosperity of mind and behaviour” in Qatari society. I felt this to be a remarkable and challenging insight. Anywhere else I have worked in the world on design policy, in developed or developing economies and societies, the thrust for design (and its rationale to political systems), has always been for competitiveness and wealth creation. In Qatar that was not the goal. In a society that had become suddenly very, very rich and that had been subsequently propelled onto the global stage bringing with it the punishing realities of rapid expansion, Her Highness had recognised the urgent need to address future social coherence and cohesion. Considerable financial wealth could surely, over time, erode innovation and entrepreneurship in its most far-reaching sense. In the spirit of the Helsinki Design Lab, I therefore firstly reflected that it could benefit all of us to consider how we might work towards eradicating poverty of mind and behaviour. My second thought was about learning. 'Education’ seems to be a word more widely and easily used than ‘learning’. And yet, for me, education and the systems of education that we maintain, can be founded on the notion of what is in effect nothing more than a ‘postal delivery service’ - the 'posting' of content and knowledge from a sender to a receiver. Surely this can never reflect the multiple dimensions of human potential. As a society, I believe we pay too little attention to the far richer concept of learning – where and how and in what ways it can really take place. What systems, or better still, in the words of panellist Ramchandra Kulkami, what attitudes do we need to develop in order to create individual and personalised learning experiences tailored to our emerging understanding of multiple intelligence and diverse learning styles. What methods and experiences can we frame and inspire, (not curricula), that would seed a love of learning for a lifetime and improve access to opportunity? This is not meant in the sense of a traditional design education, in order for everyone to be, or become, a designer. Marco Steinberg reflected on his view of design as pattern recognition. Others spoke about constructs of strategic design within a systemic view of the world. Our view of design and what it can be is maturing. How can we effectively introduce strategic design approaches into learning contexts in all levels of general education? Design learning for all, from kindergarten upwards, would bring added value to millions of individual learners who would otherwise be schooled mostly in reductionist, linear thinking utilising principally word and number. It would sensitise the next generation of politicians to strategic design long before they become politicians. They would see the value and have the tools and language to re-design political systems and discourse in order to discover better ways to confront complex challenges within long-term, rather than short-term, vote-driven, timescales. Our economies would also benefit. All young people destined for a lifetime in business and industry, but who don’t even know it yet, would already be exposed to design-enriched attitudes, language, methods and approaches by the time they get there. Design learning for all would be a useful first step in providing all sections of schooled society with a new set of personal skills, attitudes and capacities. These strategic design insights and know-how would help them to confront their future lives in the turbulent wake and uncertainties of the globally networked societies and economies. And I should add, as a side effect, it would also lead to better, more strategic designers across the wole spectrum of design disciplines. And so to my third thought. Spurred on by facilitator Alan Webber’s question, ‘Where do I look to see the future?’, I found myself recognising one particularly surprising aspect about Star Trek that I hadn’t really thought about before. In Star Trek, there is no money. Looking perhaps a hundred years ahead, not twenty, could we not now at least be starting to create a tiny seed, or at least the ‘design specification’ for a seed to speculate upon and to visualise how we might go about designing out money? Could we begin to envisage the architecture of that opportunity? There is no doubt, as we kept reminding ourselves last week, that the Helsinki Design Lab was a group of the very privileged, educated few – the “insanely successful” as someone commented on Friday. So what can happen now? Let me know what you think. The Helsinki Design Lab launches this week with the purpose of advancing strategic design as a new discipline in tackling the problems of the interdependent world. Strategic design is seen as an approach and a tool to promote societal and environmental transformation. It is bringing together proactive 'action players' in envisioning new opportunities and new connections to open out different approaches to exploring seemingly insurmountable and intransigent systemic challenges. The challenge for us all is to see how the colliding of different perspectives, believes and capabilities can be harnessed to build action that can make a change. What sets the Helsinki Design Lab apart is the concerted effort of Marco Steinberg and his team to integrate into the conversations - from the outset - the politicians, government advisors and policy makers who have access to the power and resources to implement systemic, medium to long-term change. The 2010 Helsinki Design Lab cannot only be about discovering and articulating new opportunities for practical transformation. The deeper and more difficult transformation of the perceptions, preconceptions and mental models of all involved – particularly those individuals in positions of significant influence – needs to emerge as an integral part of the journey. Only when that internal and personal shift has taken place, can the door open to new ways of working through which approaches can be devised to tackle together the problems of the interdependent world. This is the transformation that will be started this week and this is the foundation stone upon which the success of the process will depend.